A.J. Schrafel Paper Corp is a comprehensive source for paperboard for packaging as well as a number of other packaging related products. Our website provides links and information about our products and services. Feel free to learn more about AJS by browsing this website. If you need information on how to contact AJS, like a fax number or an address, you can find the warehouse and main office contact information on the Contacts page. 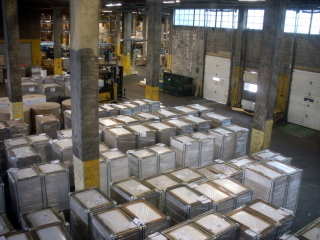 You can view our wholesale inventory by visiting our Offerings page and following the links to lists of Rolls and Sheets available for immediate shipment. This page is not an exhaustive list of our inventory, so if you don't see what you need call 1800 PAPER-BD to speak to a customer service representative. We purchase excess and surplus inventory. If you have paper you would like to turn back into cash, send us an email with a list of the material specifications. 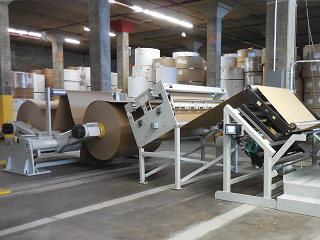 In addition to selling sheets and rolls of paperboard, AJS can convert materials from rolls to sheets for our customers. AJS has developed a number of processes that allow us to run more efficiently than a printer's in-house sheeting operation. AJS can use these efficiencies plus economies of scale to provide customer with sheeting services that cost less than if the customer attempted to do it alone. Learn more about how your company can save money by letting AJS do your sheeting for you on the Converting page. AJS has some of the most knowledgeable staff when it comes to paperboard packaging. They can help you source the materials you need. AJS's sales and customer service people are listed along with their specialties on the Personnel page. On the on History page, you can learn about how AJS began and how it has grown to become one of the major suppliers of paperboard in the United States. From all of us at AJ Schrafel Paper, thank you for visiting our website; let us know if you have any suggestions on how this website can be improved to make it more convenient for you.